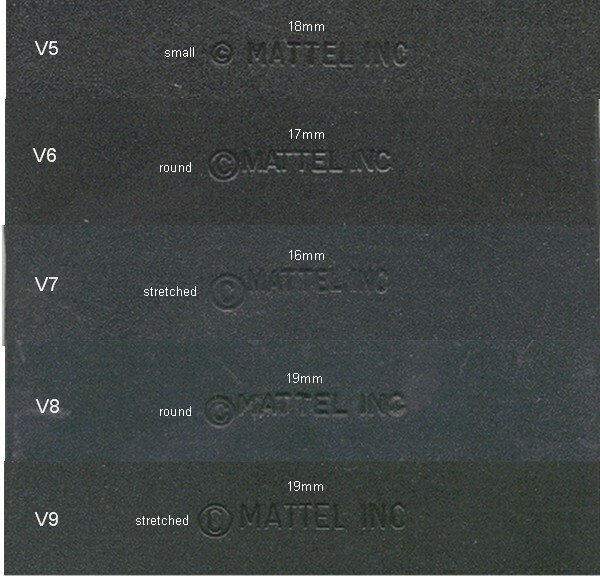 Below are the various mold differences with the various companies. This is a physical difference with the cartridge itself, not the label. 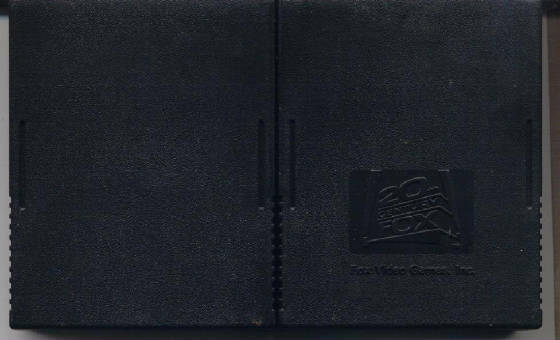 It is almost always on the back of the cartridge, due to the fact that the label usually covers the front. Some differences may be inside that we may not be able to show you, the prongs especially, though if possible, we're going to try. The 20th Century Fox mold variation is apparant shown above. The back of the first cart does not have the logo, while the second one does. Activision has known variations where the posts going into the unit either have a spring or no spring (fixed). The posts are noted above with the white arrows. By pushing down on the posts, you will know if it pushed in with some resistance (the spring), or doesn't move at all. Above are the 2 variations for the foam protector. The top is black, but has pretty much been ripped out, just some remnants left. The bottom is the white foam protector. Deep inside where you can't see are the teeth. I could not get the scanner to pick them up. Maybe someone else will have luck. 3 of the teeth are exposed with the one that has black foam here. I scanned the two carts sort of on top of each other. They are the same size, the top one is shifted a little to the right. 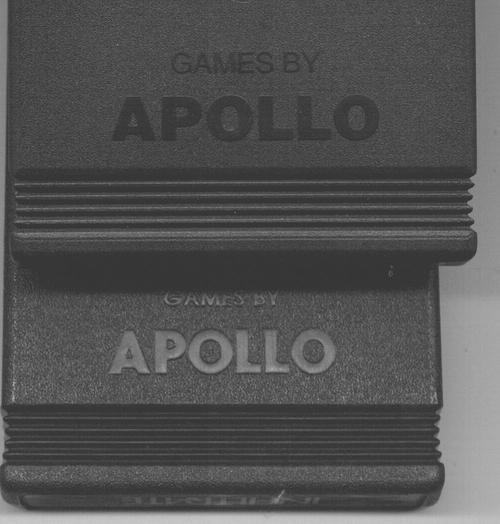 The top cart is the variation that has the Apollo 1.8" wide, the bottom has it 1.6" wide. Take a normal ruler to determine which variation you own in your collection. With the scan above, we point out the notched and square posts. The top is the notched post. It looks almost like a 2 prong fork. I have 2 arrows here, the arrow above the post is smaller and shows the width of the notch, the one below it shows the width of the post. The bottom cart has 1 arrow, showing the width of the square post. 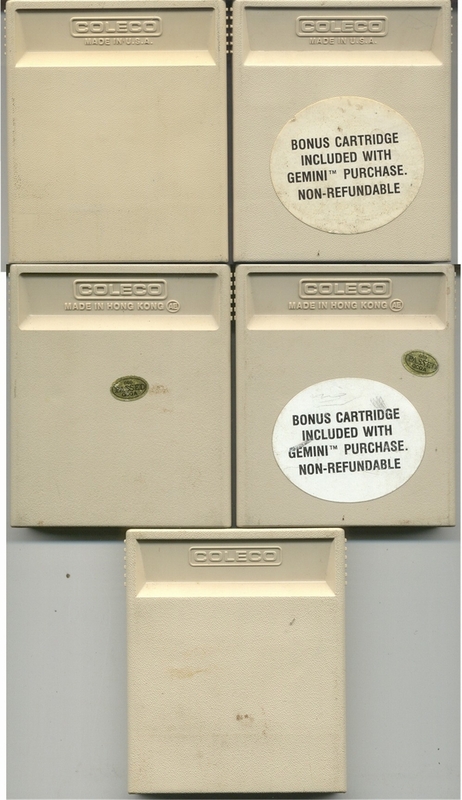 Above we have the 5 different molds for Coleco. I believe that is all of them, and if there are any others I missed, I'll try and add them. The top two are the Made in U.S.A versions, one with the Gemini sticker. The middle two are the Made in Hong Kong versions, one with Gemini sticker. 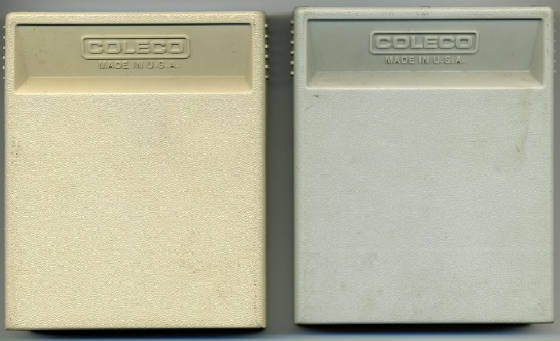 The bottom one has only COLECO molded at the top, there is no Made in. I've not noted the gold QCQA sticker, since many have this label, and it's easily removed to create a "non-sticker" version. 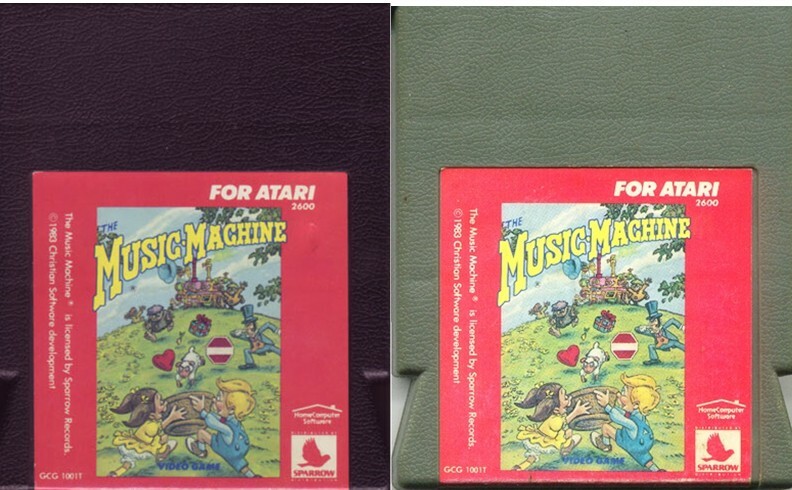 Above we see the difference between the beige color cartridge and the grey. Above we have the differences with Data Age. 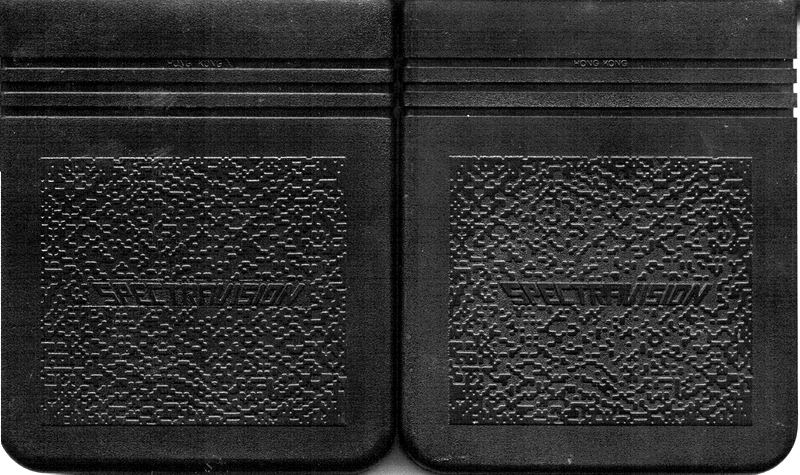 The top two carts show the difference between a rough plastic (on the left), which has the same texture as a standard Atari cart, and the smooth plastic (on the right). 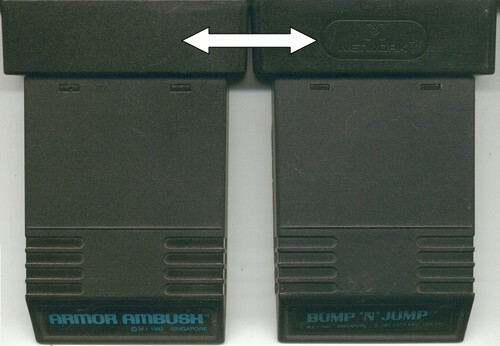 The 3rd cartridge on the bottom has an arrow showing you the round casting mark. The M Network mold variations are extensive, and sometimes so subtle, they are hard to tell the difference. I'm going to show and explain each variation, with arrows pointing at exactly what you should be looking for. One thing to know is that the easiest way to tell some of the differences is to have a ruler handy. The first and easiest distinction in M Network carts is whether or not "M Network" is molded into the front of the cart at the top. Above you see that Armor Ambush does not have the "M Network" logo while Bump 'n' Jump does. Above we have the first 3 of 9 variations for the back mold of the M Network games. I've labeled the versions as V1, V2, and V3. You can get all the exact descriptions off the giant list of variations off my website. In the meantime, here's a brief description. V1 is the snap piece. This is a square piece of plastic that snaps into the cartridge to cover the components inside. I've put 4 arrows depicting the corners of the snap piece. V2 is the line at the base. There is no copyright on the mold, but a line going across near the bottom part of the cart that goes into the system. V3 is also a line, but it has moved towards the top by the side grips near the end label. Above we have V4 on the left. This is the one where the copyright is up near the grips, towards the end label. The photo on the right is what versions 5 through 9 are. The copyright is near the base as shown. I forgot to put a white arrow, but you can see it. Since it is hard to see the detail of the copyright, the next scan will have V5 through V9 zoomed in on the copyright itself and labeled. You already know the location of where to look for the copyright. Ok, here we go. I think I did a good job with this. Just note, the small, round, and stretched refer to the © itself. The width is now in millimeters. That is the length of "MATTEL INC", measured from the beginning of the M to the end of C, not including the ©. For a real detailed description, see the giant list. This is for visual purposes. For some reason, the stupid website doesn't like my text labels and sort of took out small pieces. 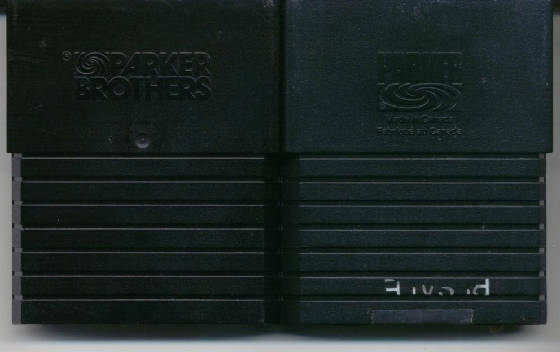 Above is the Parker Brothers variation. 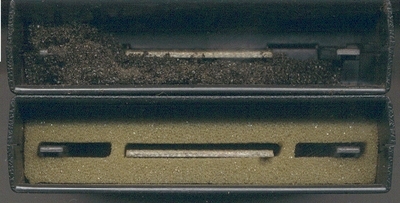 The one on the left is the standard mold on all cartridges. The one on the right is the Canadian version, where the company goes by Parker and it has Made in Canada on it. Above is the Sega cart variation. 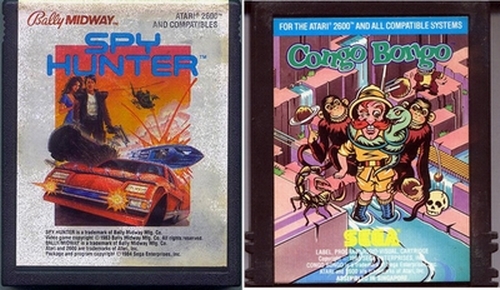 On the left, you see Spy Hunter with the standard case. This has the ridges to hold when you place the cart in the unit. 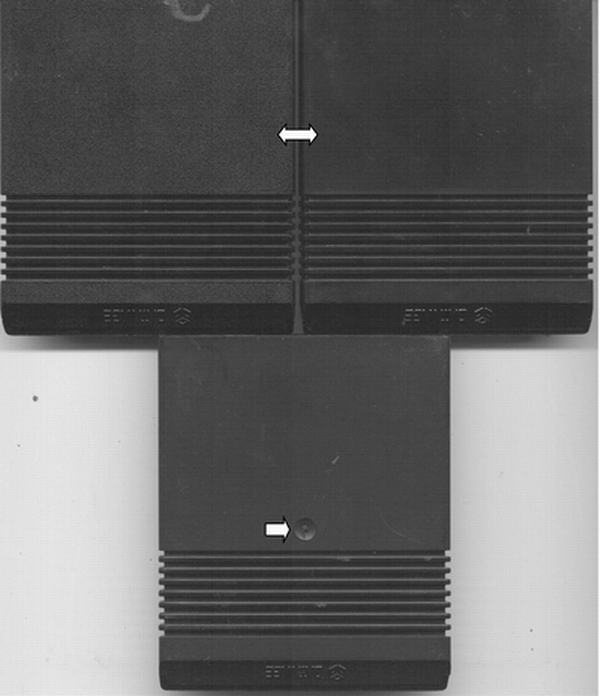 On the left, you see the normal cartridge mold that every Sega game has. Congo Bongo shows what they call the "grip" case. They look like 2 sets of prongs on each side. Only Spy Hunter and Tapper have both ridges and grip variations known. Sparrow only came out with one game, Music Machine. It's a hard game to come by once in a lifetime, but you may come across two, which may have this variation. The color of the cart itself can either be black or grey as shown. The Spectravision mold variation is a little hard to see here. 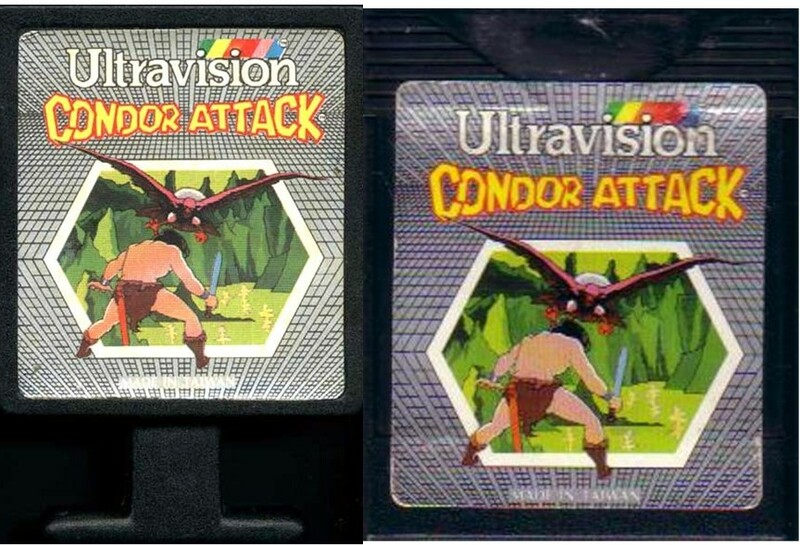 The left cartridge has a boxed line around "Spectravision" in the center, while the right one doesn't. Up close, you'll be able to tell the difference. It's a clear, defined line that actually is molded over some of the design. 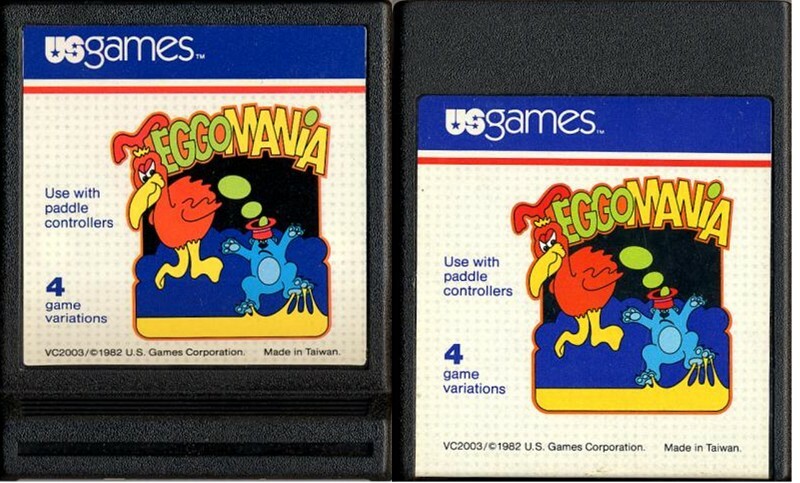 There is also a variation where "Spectravideo" is molded on the cartridge instead of "Spectravision". This also has both variations, both boxed line and no box molded around the word. Not all cartridges have been found with these variations. Most will not have the box around them. Telesys has both a standard cart and a handle cart. The standard cart is on the left. It's a perfect square cart, and the end label is totally seperate from the main label. The handle cart on the right contains only one label, where the "end" label dips down. The handle part on the bottom is below the rest of the cartridge. We're showing you the end label view also beneath each example. Almost all Telesys carts have this variation. This variation is extremely apparant. It occurs with both Ultravision cartridges. 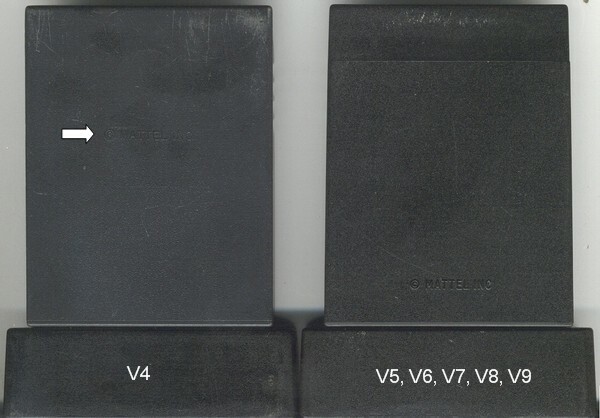 On the left, you have the t-handle cartridge, while on the right you have the standard cartridge. The US Games variation is pretty easy to spot. 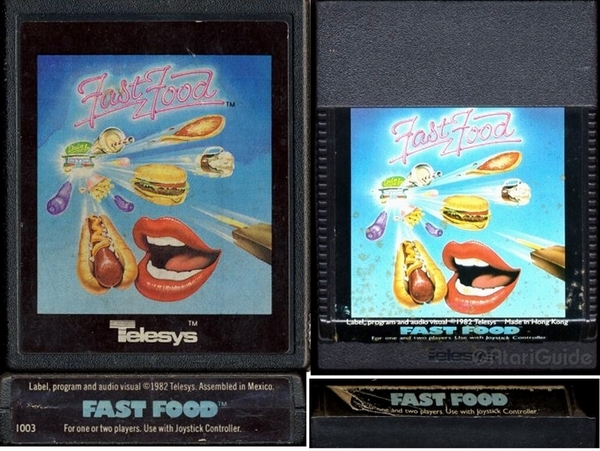 The "fancy" cartridge is on the left. It has a depressed handle that curves back up. You can easily identify this variation because the end label is seperate from the main label. 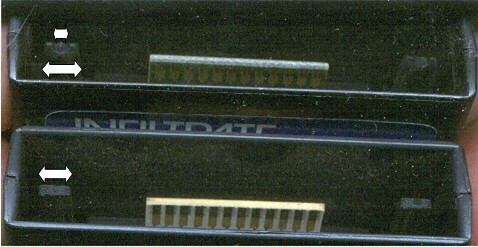 The standard cartridge is on the right, which has only one label that flaps over to the end label.